So you’ve put hours and hours into creating fantastic looking content, such as a contest, blog post, or some other Facebook campaign, only to have it drown in the torrent of the news feed. You just checked your insights and you know that your post reached over 1000 people, but only 7 people clicked on it! What gives? Unfortunately, I’ve seen it all to often – posts with great potential fall by the wayside due to poor construction. The post is a vehicle for your content to get promoted and if you put it out there in a hooptie, people are going to ignore it. But don’t worry; if your posts are suffering, you’re not alone. Millions of posts around the world meet their demise in the news feed every single day. What is it that causes some Facebook posts to succeed while others fail? Well, it just so happens I’ve been doing some research and have come across some very useful answers that will help us all in our pursuit of Facebook posting perfection. Read on as I break down the anatomy of a Facebook post, section by section, and tell you how each part can be optimized to turn that hooptie into a Lamborghini! We should talk about the copy first. All too often I see copy that is too long, confusing, or just plain non-existent! Remember that the user is scrolling quickly down the news feed and you only have a few seconds to grab their attention, so try to pack as much punch as you can into your copy. Think of your post as a billboard along the interstate and the news feed viewers as cars going by at 70 mph. How would you piece together your post now? Keep it concise. Research indicates that the shorter your copy is, the better. Our friend, Jeff Bullas, wrote a great blog article that breaks down this research. Retail brands whose posts were less than 40 characters received 86% higher fan engagement. Too short for you? I fretted when I saw that, too. 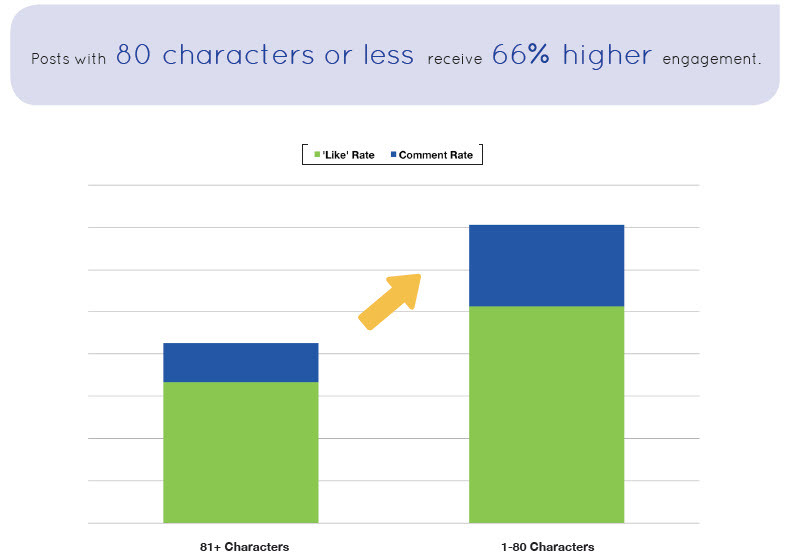 That’s alright, it appears there’s a “grace length” up to 80 characters where you’ll still get 66% higher engagement. Dare I say you could probably get away with 90 to 100 characters. Now this research is based on retailers, but I think the lesson still holds true for just about any small business. With that in mind, know that every audience is different and you know your audience best. If you’ve built an audience that responds to longer posts that’s awesome! You can probably disregard this research. But as a general rule – I’m going with the numbers and the rest of you should too. Use a creative call to action. And be sure to use an active voice with words like see, learn, and enter. Generic calls to action such as like, share, and comment will be hit or miss and they may now even shoot up a red flag to Facebook’s algorithm, so use them sparingly. Ask questions. What would you do? That’s a hard question not to answer. This is social media so create opportunities for fans to be social. Asking questions is a sure fire way to boost engagement and increase commenting. Questions are even better when packaged as part of a call to action. Images are definitely the most powerful weapon in the Facebook news feed – don’t overlook them. An image that is the wrong dimensions or confusing could spell disaster for your post, so just keep a few rules in mind and you’ll be fine. Create a link share. That’s right – links no longer have to be those little non-engaging snippet previews they once were. 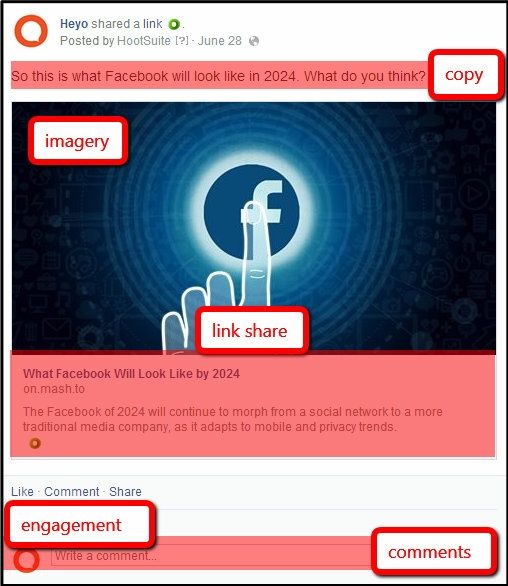 Facebook will now create large 484×252 images! This is extremely important for engaging mobile users who expect to be taken somewhere when they click on your image. Choose your image wisely. Speaking of those mobile users, you’ll also want to use an image that isn’t too busy. After all, some of the most powerful images in history are the simplest. An image that’s easy to see and can quickly convey your message is best. Remember, your post is a billboard next to the interstate! If you’ve nailed the copy and the image, chances are you’ll have people commenting – so don’t “fire and forget.” Keep an eye on the comments section of your post and be sure to respond to any that are made. When you do respond, be human and connect on a personal level. Ask more questions to bring fans back. This will show your fans that you care and can only encourage further commenting and engagement, all of which ultimately leads to higher visibility for your post. Now that you know how to craft the perfect Facebook post, it’s time to go and put what you’ve learned into action. If you’re looking to launch a mobile optimized campaign that will drive engagement, email captures, and sales, click here to sign up, and we’ll show you how to launch one that converts at 10% or higher. Do you have any Jekyll and Hyde stories for Facebook posts? What made those posts good or bad? Have you made any changes that improved or worsened your results? I’d love to hear your thoughts, questions, and comments below!